In December 2006, I moved every thing to my new blog address since this blog was using the embedded WP that I had no control over it. It took me almost 18 months to understand a little bit about WP, and finally I could pull out all the old postings from here and placed them in the new WP installed in the same server. Of course I have the full control of this new WP. The only trouble is, when I exported the WP, somehow, I didn’t realize that the pictures were not imported correctly. Accordingly, we lost some of the pictures in the original postings. However, the date and the content of the postings were there. I will slowly move the pages from atanone dot net site, and slowly I’ll populate this site and let my other site deal with my new adventure on how to make money online, and using the money to continuesly support some charity works that I could help. This blog has a new address…. At the end of December, I have moved this blog to a new address, and I will not update this site anymore. I have called the Tech Support and they confirmed that there was no way to move all the postings from here to the new site, and that’s why I’ll keep this site to keep all the posting and especially all the comments. The new site gives me more flexibility to design the look of the blog and to make all the changes I need. Please visit my new site. Rest in Peace, my friends and cousin Ros. It was supposed to be a joyfull Christmas morning. We were staying late after midnight mass (starting at 11PM though) so I was still in bed when my cell phone rang this morning. I couldn’t get the phone in time, and when I checked the voice message, it broke my heart. A former colleague and a dear friend of mine, Dr. Junibakti Sanubari passed away last night (Christmas day in Indonesia) at a hospital in Bandung while visiting his daughter in college. They were on their way home and stopped by his sister in law’s home in Bandung. That was the question a friend of mine asked me this morning, when I showed him this blog and told him to use the same webhosting that I’m affiliated with. He could not understand why am I doing this? Three reasons, I told him. First, I would like to update my linkpage in a quick and easy way. In the past I tried to update by adding a what’s new section in my index page, but it was a tedious job. I need to go through editing, uploading process etc. With a blog, it’s much easier and I can update it individually without tying it to any page. This is a good starting place where I can learn the art of blogging and how to make money. Today is the end of my off days and I spent a lot of time surfing the sites listed in members of seasat-L’s emails. The first one was Alberto’s site in Italy. Of course it was in Italian, but the pictures speak the universal language that we all could understand. I admire his works displayed in his photo gallery and I wish I could read Italian so I can read all the descriptions there. I was also surprised to find from the links described in Italian these few sites in English. K3’s Astrophoto pages as well as Poor Meadow Dyke Observatory websites are those sites that provide tons of information on Astrophotography and its Instrumentation. My first thought was to bookmark the site since I need to get back to it later. I was checking the reports on seasat-L list for December 19 on ISS and STS-116 passes last night and came across the email of Tom Wagner which provided the link showing the picture he took at Waterloo, Iowa. 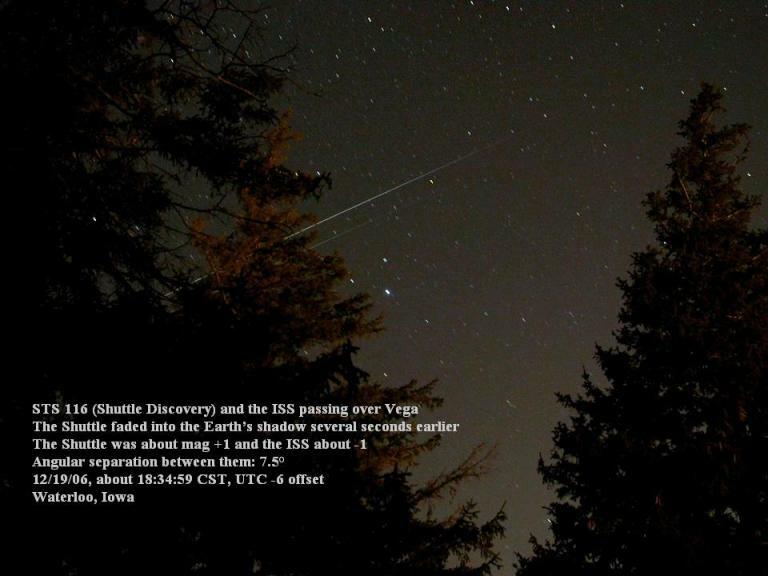 The image shows the tracks of both the ISS and Space Shuttle where the ISS’ track was brighter than the Shuttle’s. As I mentioned in my note last night, due to the cloudy sky here in Huntsville, I could only caught the tail of that same pass seeing a bright spot before they disappeared into the shadow. Tom is so generous to let me display his picture here, but if you want to read Tom’s note, please check this link. Haven’t seen it with my naked eyes for a long time…. For the past six days, due to my work, I could see all the images that coming down thru video links and listen to most of the voice loop traffics. However, it has been a while since I saw the ISS with my naked eyes. When I got home from work this evening, my mind was still in one of the experiments that was just started less than two hours before I left. When I was looking at the Space Links at my old site few days ago, the first link listed was the link to Meteor 2001 at Astrophoto website. Now you know how long I haven’t edited that site. That was the reason I then added this link there. Today I went to check John Locker’ site and watched some of the videos John has taken over the years including the solar transit of the ISS. As I said in the beginning when I started my linkpages, there are tons of materials on the Internet and that’s why I had tried to reduce the number for my quick links to a minimum as a gateway for the beginner visual satellite observers. Of course by doing that, I have omitted many nice sites. There are at least five wmv format videos at Kevin Fetter archives showing the images of satellite passing through the moon along with many other videos of satellite crossing the night sky. I went there after seeing the videos at some of the links Kevin posted on Dec 8, including the videos of COSMOS 252, FENGYUN 1B, IRIDIUM 914, IRIDIUM 56 etc. Few days ago, while searching for other links, I also came across Thomas Fly’s site on computing sun & moon transit by ISS with the aid of J-Pass. His work had been referred to by many others, such as Science@NASA or Hobby Space. There are 14 posts and 20 comments so far and you can feed on them.